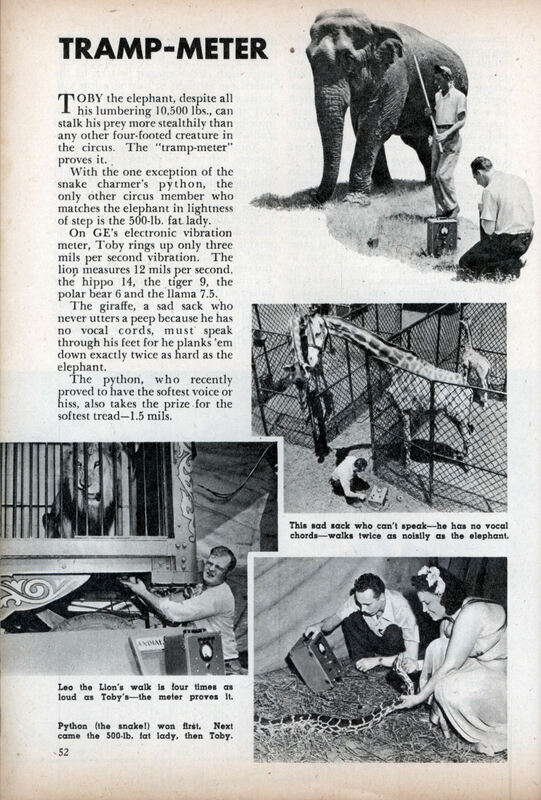 TOBY the elephant, despite all his lumbering 10,500 lbs., can stalk his prey more stealthily than any other four-footed creature in the circus. The “tramp-meter” proves it. With the one exception of the snake charmer’s python, the only other circus member who matches the elephant in lightness of step is the 500-lb. fat lady. On GE’s electronic vibration meter, Toby rings up only three mils per second vibration. The lion measures 12 mils per second, the hippo 14, the tiger 9, the polar bear 6 and the llama 7.5. The giraffe, a sad sack who never utters a peep because he has no vocal cords, must speak through his feet for he planks ’em down exactly twice as hard as the elephant. The python, who recently proved to have the softest voice or hiss, also takes the prize for the softest tread—1.5 mils. Exactly what kind of prey does an elephant stalk? I want a tramp-meter. It ‘d save me a lot of time then I go to the bar.